This story was delivered to Business Insider Intelligence „Fintech Briefing“ subscribers. To learn more and subscribe, please click here. UK’s digital-only bank OakNorth raised $440 million, with $390 million coming from SoftBank’s Vision Fund and $50 million from Clermont Group, per CNBC. The banking startup offers competitive personal and savings accounts, business loans, and property finance. It specializes in small- and medium-sized business (SMB) lending, extending loans from £500,000 ($648,000) to up to £40 million ($52 million), and has a loan book of over £2 billion ($2.6 billion) to date. The banking startup reported a pre-tax profit of £10.6 million ($13.7 million) in 2017, making it the first digital bank in the UK to report annual profit, per the Financial Times. OakNorth previously completed a £78 million ($100 million) funding round in September 2018, indicating there’s significant investor interest in the startup. The deal represents Europe’s largest fintech fundraising to date. The funding brings OakNorth’s post-money valuation to $2.8 billion, making it the region’s most valuable fintech. European investment in challenger banks has been robust so far this year, with OakNorth’s mega-round coming just one month after N26 raised $300 million, gaining unicorn status at a valuation of $2.7 billion — extremely close to that of OakNorth. 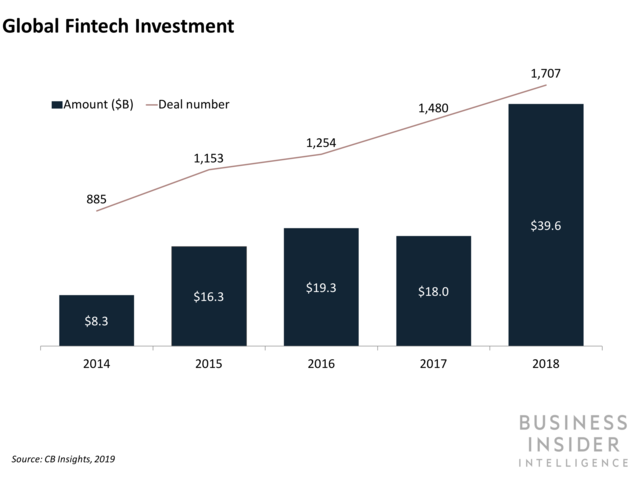 None of Europe’s fintechs secured more than $300 million in funding in 2018, indicating investments in 2019 have been off to a very strong start in the region. OakNorth’s focus on medium-sized companies and ability to scale outside the UK play a key role in its success. The digital bank attributes its fast growth in part to its ability to service medium-sized businesses — an underserved market as traditional banks focus on big companies and alt lenders such as Funding Circle, which extends loans of up to £500,000 ($648,000), primarily target smaller-sized entities. Importantly, OakNorth has been able to scale its proposition globally by licensing its OakNorth Analytical Intelligence technology to banks in nine countries outside the UK — across the US, Europe, and Asia — and has around $5.7 billion in assets under service. Partnering banks are able to save time and resources by leveraging OakNorth’s technology to conduct speedy credit analysis, extend bespoke loans, and proactively monitor their portfolio. This has helped the bank scale outside the UK without assuming any of the credit risk of lending in markets it does not fully understand or having to invest in acquiring banking licenses in other countries. We expect the digital bank’s growth, both in terms of its UK loan book and cross-border partnerships, to accelerate as it continues to attract high-profile backers and further develops its OakNorth Analytical Intelligence technology.